Pork and beef, water, salt, dextrose, paprika, sugar, flavoring, sodium phosphate, sodium erythorbate, sodium nitrite. Gluten free. 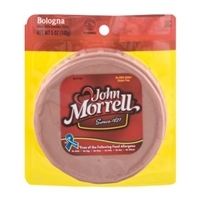 JOHN MORRELL BOLOGNA.NO MSG ADDED.GLUTEN FREE.FOOD ALLERGY RECOGNITION*. *FREE OF THE FOLLOWING FOOD ALLERGENS:NO MILK, NO EGG, NO NUTS, NO FISH, NO SOY, NO WHEAT.SINCE 1827.WWW.JOHNMORRELL.COM. 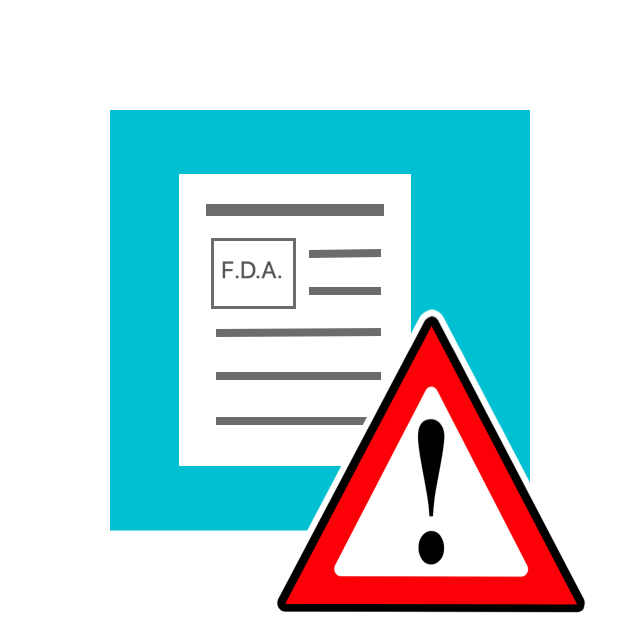 Mechanically separated chicken, pork, water, corn syrup, modified food starch, dextrose, salt, contains 2% or less of beef, extract of paprika, flavorings, potassium lactate, sodium diacetate, sodium lactate, sodium nitrite, sodium phosphate, vitamin c (ascorbic acid). Gluten free. 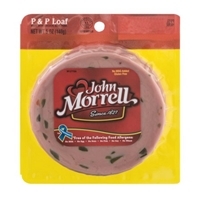 JOHN MORRELL P & P LOAF.NO MSG ADDED.GLUTEN FREE.FOOD ALLERGY RECOGNITION*.FREE OF THE FOLLOWING FOOD ALLERGENS:NO MILK.NO EGG.NO NUTS.NO FISH.NO SOY.NO WHEAT.INSPECTED FOR WHOLESOMENESS BY U. Mechanically separated chicken, corn syrup, diced sweet pickles (contains cucumbers, sugar, water, salt, vinegar, alum, natural and artificial flavors, turmeric, benzoate of soda added), water, beef, pork, modified food starch, salt, sweet red peppers, contains 2% or less of potassium lactate, sodium lactate, dextrose, sodium phosphates, sodium diacetate, flavorings, sodium erythorbate, sodium nitrite. Gluten free. 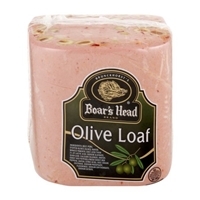 BOAR'S HEAD OLIVE LOAF.0G TRANS FAT PER SERVING.GLUTEN FREE.GOOD SOURCE OF PROTEIN.MILK FREE.NO MSG.BOARSHEAD.COM.2009 BOAR'S HEAD PROVISIONS CO., INC. Beef, Pork, Stuffed Olives (Olives, Water, Minced Pimento, Salt, less than 2% of Lactic Acid, Sodium Alginate, Guar Gum, Calcium Chloride), Water, Sweet Red Peppers (Fresh Sweet Red Peppers, Water, Citric Acid), Salt, Sugar, Dextrose, Sodium Phosphate , Flavorings, Sodium Erythorbate, Sodium Nitrite. 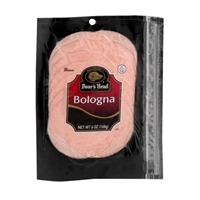 BOAR'S HEAD BOLOGNA.0G TRANS FAT PER SERVING.GOOD SOURCE OF PROTEIN.GLUTEN FREE.MILK FREE.NO MSG.BOARSHEAD.COM.2014 BOAR'S HEAD BRANDS. Pork, water, beef, salt, less than 1.5% of dextrose, sugar, sodium phosphate, paprika, sodium erythorbate, flavorings, sodium nitrite. Gluten free. 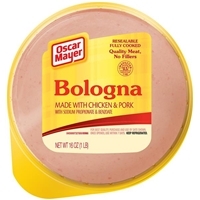 OSCAR MAYER FULLY COOKED BOLOGNA. AMERICA'S FAVORITE. QUALITY MEATS. OVER 125 YEARS. RESEALABLE. 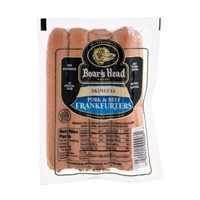 QUALITY MEAT, NO FILLERS. MADE WITH CHICKEN & PORK. 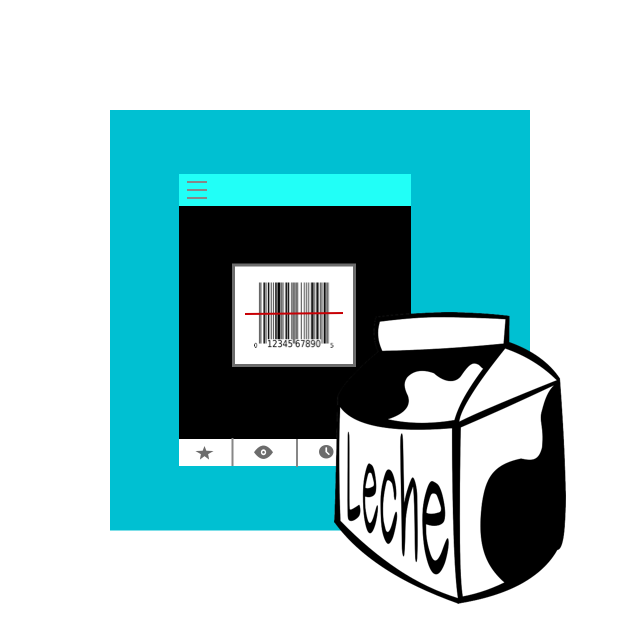 INSPECTED FOR WHOLESOMENESS BY U.S. DEPARTMENT OF AGRICULTURE P-2310. 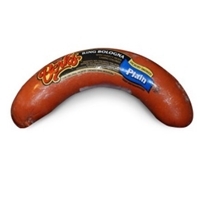 Brand/Manufacturer: Oscar Mayer Kraft Foods, Inc. Mechanically separated chicken, pork, water, corn syrup, contains less than 2% of salt, ground mustard seed, sodium phosphates, sodium propionate, potassium chloride, sodium diacetate, sodium benzoate, flavor, sodium ascorbate, sodium nitrite, extractives of paprika, oleoresin celery seed. 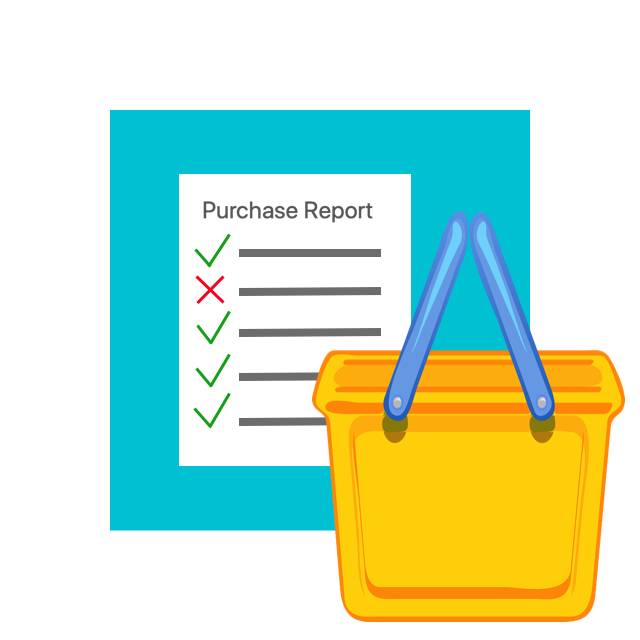 Brand/Manufacturer: Berks Berks Packing Co, Inc. Beef, Pork Hearts, Pork, Water, Natural Flavor. Contains less than 2% Dextrose, Salt, Sodium Phosphate, Hydrolyzed Soy Protein, Extractives of Paprika, Sodium Erythorbate, Sodium Nitrite. 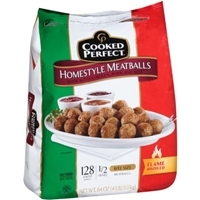 Brand/Manufacturer: Cooked Perfect Home Market Foods, Inc. Mechanically separated chicken, water, pork, beef, textured soy flour, dextrose, soy protein concentrate, bread crumbs (wheat flour, salt, and yeast), salt, seasoning parmesan cheese (part skim cow's milk, cheese cultures, salt, enzymes), spices, spice extractives on a dextrose carrier, dehydrated garlic, parsley, onion powder), sodium tripolyphosphate, natural flavor.allergen information: contains soy, wheat and milk.